Intro: [beginning clipped on available tape] now, to travel with the Doctor and Jo through the time-space continuum, back and forth, as though it were a cosmic expressway. This will not be a pleasure trip, because it will comprehend... the "Day of the Daleks." (opening credits get as far as the Doctor's face appearing, and the announcer comes back on) Or rather, "The Curse of Peladon"! "Next Week": Your announcer, who was, at the beginning of the program, himself caught in a time-space anomaly, is properly chagrined. 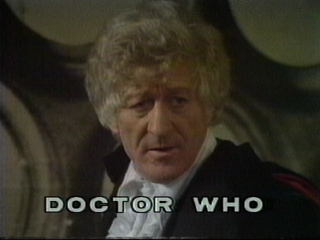 Next week, the Doctor contends with the poor relatives of the Silurians, "The Sea Devils."